This is The IDP Guru writing to you from the Windy City. It's been a hectic two days as I'm still getting acclimated to my new job and the city. To lessen the burden and stress upon myself and to free up some more time for me to answer specific, roster-related questions, I have decided to discontinue writing my weekly Thursday article, "IDP Stockwatch." I wish I had more time to write this article, but sometimes life interferes and we have to prioritize things and cut things out of our schedule. Jason Williams got the start over Nic Harris this week for the Panthers on the weak side and produced fairly well (5-2-0, FF, FR). His value is going to be quite similar to that of Nic Harris' when he was starting on the weak side. LaRon Landry missed another game with an Achilles injury and his status for future weeks is still up in the air. I cut bait with him in a very shallow league (with no bench IDPs) last week just because I wasn't sure how long he was going to be out. Bernard Pollard had yet another disapointing performance; however it was mainly due to the Titans inability to move the ball on offense as opposed to a change in scheme or performance on Pollard's part. David Hawthorne had his 2nd straight monster tackle performance. I still wouldn't trust him as an every week starter, but he is a good risky play in solid matchups down the playoff stretch run. Sean Weatherspoon saw increased action from his Week 11 game, but still shouldn't be fully trusted until he shows us that he's capable of playing every down effectively. 1. LDE Jason Pierre-Paul (NYG) vs. WAS - Great name, potentially great player, and great matchup. JPP saw his most extensive action of the year last week and made the most of it with 8 total tackles, 2 sacks, and 2 forced fumbles. That should earn him some increased playing time and with a very juicy matchup against the 'Skins, he may serve as a sneaky play in extremely deep IDP leagues. 2. RDE Haloti Ngata (BAL) vs. PIT - Ngata has done "natta" since Week 9, but it's important to note that the last time he played the Steelers, he had his best game of the season with 11 total tackles and a sack. This matchup tends to be a hard-fought battle of the trenches and I expect Ngata to come through with solid DT1 numbers this week. 3. LDE Cliff Avril (DET) vs. CHI - Typically any player who rushes the passer consistently and plays against the Bears is a decent option on any given week. The Lions get there shot at Jay Cutler this week making KVB and Ndamakung Suh attractive options. It's unlikely that either of these two players are available on your waiver wire, however. With this being said, Avril is worth a shot if your desperate to fill that DL2/3 spot. RDE Chris Long (STL) @ ARI - Long has really come into his own this season and is a big reason why the Rams are much improved on defense. Even when he hasn't been sacking the quarterback, he has been applying a consistent pass rush and pressure. He should have a field day against Derek Anderson and the Cardinals next week. He's a DL1 option in my opinion. 1. WILB Rocky McIntosh (WAS) @ NYG - McIntosh played fairly well in Week 12 after battling a thigh injury in the previous couple of weeks. He has another favorable matchup Sunday against the NFC East rival New York Giants. "Rocky" may have been dropped in some shallower leagues after a couple of below average games in weeks 10 and 11. If he's out there and you need a decent option at LB2, he is a good choice. 2. MLB Barrett Ruud (TB) vs. ATL - Ruud capitalized on a very favorable matchup last week by posting 9 total tackles (6 solos). He gets another great matchup this week against the Falcons and should post similar numbers and his LB2+ status carries over to this week. 3. SILB Akinola Ayodele (BUF) @ MIN - For those is deep, deep leagues, Davis is worth a look this week. The Bills have consistently had some of the highest tackle opportunities for any defense in the league this season. In his last two games, Davis has accumulated 20 total tackles. The Vikings have been one of the better matchups for opposing linebackers this year and Davis could have LB3 value for Week 13. 4. SILB James Farrior (PIT) @ BAL - I recommended Farrior last week even though his matchup was mediocre and he came through in clutch fashion with a 4-2-1 stat line. His matchup against the Ravens this week is a much better matchup and he should post 7-9 tackles and be a solid LB2 option for IDP owners. 1. LCB Jabari Greer (NO) @ CIN - The Bengals tend to get behind early and force themselves into passing situations and consequently opposing cornerbacks have been quite busy when playing them. Greer (and Tracy Porter for that matter) are both decent DB3 options this week. 2. SS Reed Doughty (WAS) @ NYG - Assuming trash-talking superstar LaRon Landry is out yet another week with an Achilles injury, Doughty remains an above average play against the Giants this week. Obviously this is a situation that takes close monitoring, so make sure and confirm that Landry is indeed inactive this Sunday. 3. LCB Aqib Talib (TB) vs. ATL - Roddy White had his worst fantasy perfomance of the year against the Packers last week and I would have to imagine that he will be heavily involved in the gameplan this week against the Bucs. Talib is more than likely going to be covering White for most of the game and should have a decent enough performance for CB2-type numbers. LCB Terrence Newman (DAL) @ IND - It's very rare that I would recommend Newman two weeks in a row, but considering that he has another great matchup, it makes sense. Newman had 8 solo tackles in last week's Thanksgiving day contest against Drew Brees and the Saints and gets the pass happy Colts this week. Manning will be out for redemption after an embarrasing performance last week on SNF and will likely torch the Cowboys lackluster secondary all game long leading to plenty of tackles for Newman. Thanks a bunch for reading and feel free to ask me any specific questions. I want to help you dominate your fantasy leagues! 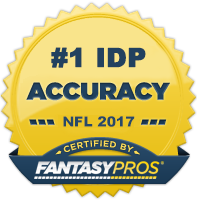 Until next time, this is The IDP Guru signing off.